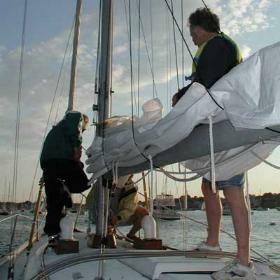 Atlantic Charters offers sailing instruction programs for every skill level. With a true passion for sailing, a healthy respect for the sea, Captain Alan Leibovitz has taught sailing, safety and seamanship to hundreds of Atlantic Charters clients. Group classes are taught exclusively onboard, with class sizes limited to 6 students in each class, to ensure each student receives plenty of sailing experience. Whether you are a first-time sailor or have some experience under your belt, we can accommodate your skill level and help you achieve your sailing goals. If you have specific sailing goals, or simply need a refresher lesson, we offer private one-on-one sailing instruction, customized to meet your requirements. Please contact us to arrange a consultation. Learning to sail can be fun. This course covers the fundamentals of sailing and small boat handling for those with little or no sailing experience. Designed to inspire confidence while sailing the harbor with “hands on” instruction, you will be able to skipper a small boat in a very short time. This course is taught in the Ensign 23 which is well designed for beginners. It’s fixed keel provides excellent stability and its handling is predictable and forgiving. Upon successful completion of the Basic Keel class, students are invited to rent one of our sailboats and set sail on their own or join our Sailing Club! Courses start daily from April to November 1st. Classes meet from 9am – 1pm or 1 – 5pm and accommodate a maximum of 6 students. This course assumes a student can sail a day sailer and helps to meet the challenge in handling a larger boat and the technical and navigational skills needed off shore. We will review the fundamentals and expand on your foundation by exercising advanced sailing skills, handling a boat under power and anchoring techniques. Skills you will need for your first weekend cruise. 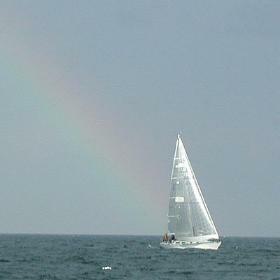 Sailing Lessons are available from mid-April through the end of October. Courses start daily. Please contact us in advance to sign up for your sailing lessons. Availability is limited, so please book early! Call us at 978-590-4318 or send us email. $545 for twenty hours instruction.